GROHE SilkMove: the SilkMove cartridge inside the faucet, guarantees long-lasting smooth operation of the faucets. It creates ease of use at the highest level - and even years later. 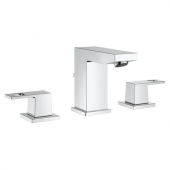 GROHE StarLight: with the StarLight surface, a long-lasting surface aesthetic is guaranteed. A dry cloth is enough to clean the particularly smooth surface and to make it shine again. In addition, the surface is resistant to scratches. Save time on housework and always enjoy a shiny tap in your bathroom. GROHE EcoJoy: with EcoJoy you enjoy high water comfort while saving resources and money. This is made possible by the built-in flow limiter and aerator. The maximum flow rate per minute is only 5.8 liters and yet you do not have to forgo a voluminous jet. GROHE QuickFix: the QuickFix function ensures quick and uncomplicated installation of your new GROHE faucet. It saves you 40% time during installation. This is possible because the tap consists of only a few parts, have flexible connecting hoses and the installation instructions are clear and simple. Swivel spout: Each faucet series offers at least one faucet with swiveling spout. This provides a 90-degree swivel radius (45-degrees in each directions) and provides plenty of freedom of movement on the vanity. Due to the swivel limitation, the valve can still not hit anywhere. Due to the different design directions, there is something suitable for every bathroom. For example, the Lineare design is rather minimalist, while Eurocube convinces with its cubic design. 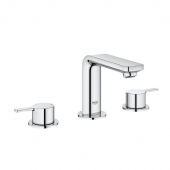 The taps of the Lineare series are presented with a minimalist and appealing design. They combine the two geometric forms cylindrical and rectangular to a harmonious overall picture. 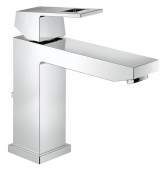 Due to the different spout heights, the faucets can be easily adapted to different washstand sizes such as the washbasin in the guest bathroom or the wash bowl. Thus, offer the right solution for every bathroom. With the Lineare collection, you can design your washbasin, shower, bathtub and bidet uniformly. When it comes to surface color, you can choose between stainless steel look and chrome. 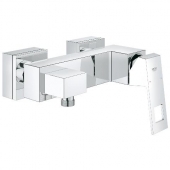 The Eurocube faucets are presented in a cubic design with clear structures and right angles. 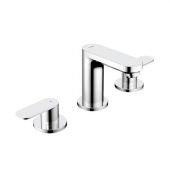 These taps will make your vanity, shower, tub and/or bidet expressive and characteristic. Especially in an ensemble, they can unfold their full design potential. The cubic design of the Eurocube series can also be used in the kitchen. 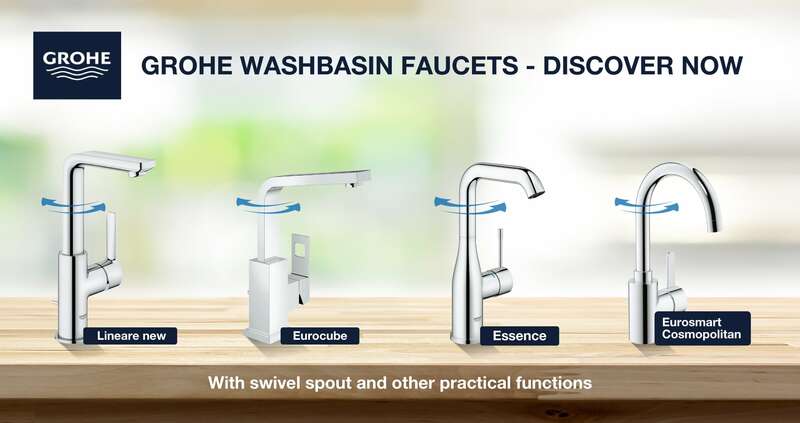 The Eurocube faucets are available in different heights for different sink sizes. The mounting variants also offer a great deal of design freedom. In addition to the classic stand mixer, the collection also includes 3-hole washbasin mixers for stand mounting or a 2-hole washbasin mixer for wall mounting. The Essence taps have a very special design. Modern and minimalist, they blend discreetly into your bathroom. Here dominate round, slim forms and an organic line. A highlight of the series is the wide range of colors of the faucets. Choose between ten surfaces such as chrome, cool sunrise brushed, nickel brushed or stainless steel and add variety to your bathroom. In addition to the colors, the different fitting sizes and mounting types ensure multiple design variants and an individual look. The Essence series can be used to furnish your complete bathroom, including a washstand, shower, bath and bidet. In addition, you can let the modern shapes and colors in your kitchen.